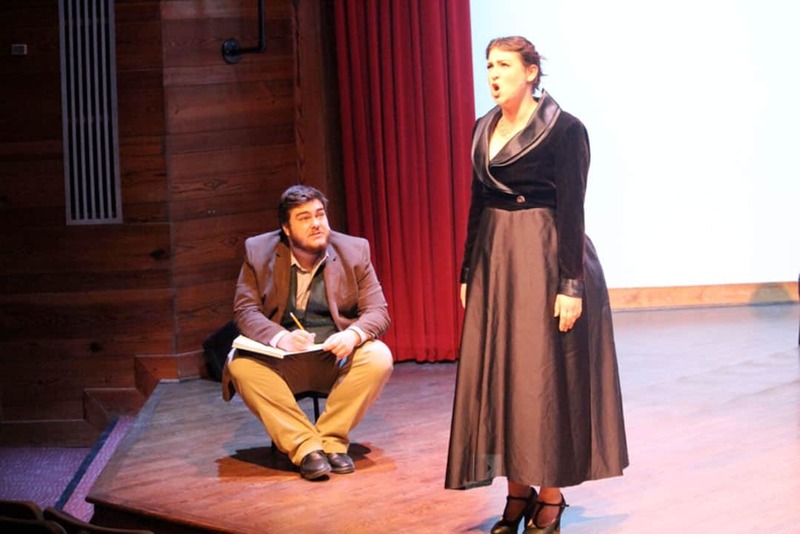 The Trinity College Dramatic Society (TCDS) opened its last show of the 2017–2018 season with a visually stunning production of the musical Sunday in the Park with George on Wednesday, March 21. Directed by Shannon Dunbar, the play examines the creation of real-life artist Georges Seurat’s masterpiece “A Sunday Afternoon on the Island of La Grande Jatte,” which features Parisians promenading at a park on the riverbank. It is a theatrical look at the artistic process, told with honest and humorous truths about life and love, and set in both the past and present. The story loosely follows the artistic endeavors of George (Winston Sullivan) as he struggles to create meaningful art and maintain a relationship with his partner Dot (Jocelyn Kraynyk). George is obsessed with achieving perfection in his artwork and strives for the approval of the artistic community; in the process, his art thrives while his love fades. Sullivan and Kraynyk are talented in the lead roles, giving strong performances in their acting and singing abilities. Kraynyk in particular carries the show with compelling vocals that clearly convey Dot’s frustration with George’s preoccupations. The supporting cast, whose characters are included in the painting, is also skillful in bringing comic relief to the show in song and dialogue. Ethan Raymond as Jules, a successful artist, Olivia Thornton-Nickerson as George’s forgetful mother, and Cole Currie as the rowdy boatman provide contrast to the visceral portrayals of George and Dot. While seemingly ordinary at first, the set includes a large projector screen that serves as the backdrop. The screen comes to life in brilliant animations of George’s famous painting in its various stages, from a simple pencil sketch to the final coloured product. These animations are powerful in visualizing George’s artistic development, and they add depth to the actors’ performances in the foreground as well. Another highlight was the show’s accompaniment by a live band onstage, with music from the original production by James Lapine and Stephen Sondheim. Musical director Michael Henley’s score complements the vibrancy of the scenes as they occur, as well as the pointillism style of George’s painting. Sunday in the Park with George has a striking juxtaposition of musical and visual art aspects, especially in its animated set design. It’s an enjoyable theatre-going experience, one that gives a poignant examination of the lives of the people in the painting. Disclosure: Ethan Raymond is one of The Varsity’s Lead Copy Editors; Cole Currie is The Varsity’s Deputy News Editor.